Today, in the age of information, people are paid for their ideas: to create original knowledge products or add value to existing products. Given their self-reliance, it is not surprising that workers take pride in their outputs—up to half of employees take a portfolio of files with them when they leave. When employees move on, many feel entitled to the work they’ve created.They presume it is acceptable to transfer work documents to personal computers, removable media, tablets, smartphones or online file sharing apps. Some pilfered data is innocuous and already in the public realm. But some of it is classified. 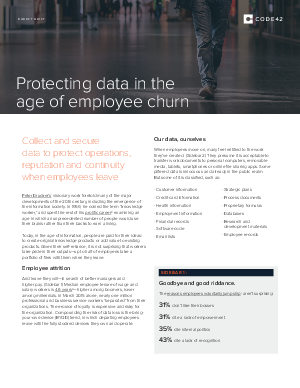 Read this paper to find out how to collect and secure data to protect operations, reputation and continuity when employees leave.